If you want to use Microsoft Word to create more than just simple documents, start with this ultimate Word guide. Packed with the in-depth content that is the hallmark of all Wiley Bibles, this book covers it all. You'll first find out what's new in Word 2013 on the features level - formatting, styles, tables, and more - before you dive into the big stuff that can help you become more efficient. From document design to creating master documents to applying security to collaborating in the Cloud, you'll learn not just how to do tasks, but the best ways to do them, and why. Start creating documents at a new level and wow your colleagues, with Word 2013 Bible. Lisa A. Bucki has been teaching and writing about Microsoft Office, computers, and software for more than 18 years. She coauthored theOffice 2010 Bible from Wiley. Whether you're putting together complex manuscripts, updating your resume, editing reports, or adding graphics to a short story, chances are you're using Microsoft Word. Word is so dominant, it's probably a prerequisite for most jobs. And with Windows 8 and enhanced online integration, Word continues to evolve. 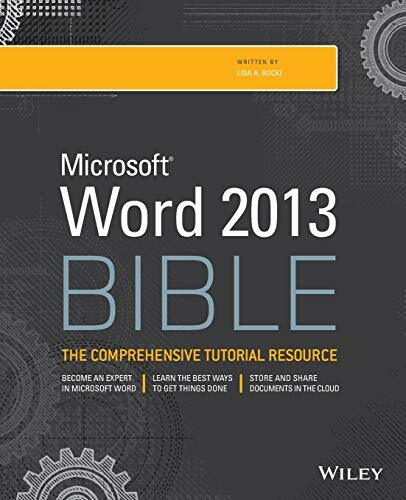 For all the ways you need to use Word, first turn to this indispensable Microsoft Word 2013 Bible. It will show you how.